MLB Woven Towel with Hook & Grommet (Dimensions 16" x 22") (Select Teams Available) - $15.49 - GolfersEdgeOnline.com - Best Golf Equipment On The Web! 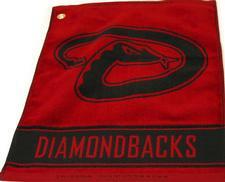 Add some team spirit to your golf game with the Team Golfs MLB Woven Towel. This team-colored towel features your favorite MLB team's logo and name, letting everyone know you're the ultimate MLB fan. The towel also comes with two jacquard hems on the top and bottom that have the full team name. Put your team pride at the top of the leaderboard with the Team Golf Woven Towel. If you have any more questions about the MLB Woven Towel with Hook & Grommet (Dimensions 16" x 22") (Select Teams Available); do not see the model you are looking for; need custom options; or prefer to not purchase online, then please call us at (630) 656-1291.